Our #Hashtag Printers For Sale can amazingly print photos at guest and corporate events through the power of #hash tag. Customers capture their own Twitter and Instagram pics with a mobile phone or tablet device. Uploaded to social media with a unique hashtag, our range of printers will automatically display all photos using that hashtag. Customers can then instantly print any photos of their choice in a high quality 6×4″ print. 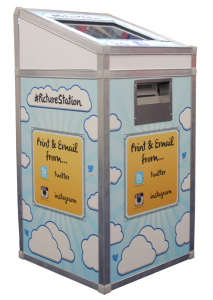 Easy to use, the PictureStation #Hashtag Printer is an instant print photo kiosk, that allows you to print and share your digital pictures wirelessly from your mobile phone using a set hash tag phrase “ eg #PictureStation” on Twitter or Instagram. Alternatively the picture station can collect images via Wi-Fi. Scroll through the images on a 19” fully backlit touchscreen.